Nokia's Chris Weber took to the airwaves at CES to talk a bit about the strategy going forward, and he said the company will focus on its key areas of differentiation - mobile imaging, carried with the PureView branding, and navigation with the Here mapping solution. This ecosystem game is not for the faint of heart. It's difficult. It takes massive investment. Microsoft's ecosystem goes beyond phones to tablets, PCs and gaming systems. An ecosystem won't survive without that. It has to have rich assets. We have to earn the right to be that third ecosystem. But they have the building blocks and the platform that scales beyond mobile phones. I think those companies that don't have that will be quite challenged. 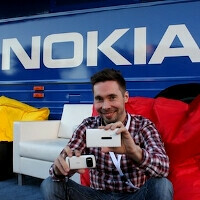 Speaking of PureView stuff, a topic which excites us most certainly, in a separate interview Juha Alakarhu, head of imaging technologies at Nokia, sat at CES to say we should expect "very cool" stuff from the talented PureView team this year. I think it’s important to underscore that PureView doesn’t mean any specific technology. It’s the latest and greatest in imaging. When you buy a Nokia phone with PureView, you are getting our highest quality imaging innovation... it’s basically about problem solving. Nokia 808 PureView solved the problem of zooming and sharpness, and for Nokia Lumia 920, it was low light. Imaging is extremely subjective, and you can always make something better. We’re really driving innovation in key areas to deepen and enrich the imaging experience. I can’t tell you about the specific things we’re working on. Safe to say it’s very cool. We’re looking at imaging holistically, from optics to display, and working on all of those to improve. It’s very complicated, and the trick is to make all these building blocks work well together. But it’s not just purely hardware innovation. You need to get the software to work as well. That’s the real beauty — that’s what makes a truly amazing solution. I’m really proud, we have a damn good team. Hardware doesn’t work without very good software, and there’s no software that can fix bad hardware. Asked if there’s one major problem he would like to solve in the years ahead, Juha takes his time before answering. I’d love to make it super easy to get great photos every single time,” he tells us. “You should be able to give your phone to a 3-year old and still capture amazing photos, like with a big DSLR camera. People are working on exciting technologies that can capture so much more. Huge innovations are happening right now. We’re looking at imaging from so many different angles. Amen to the three-year old getting a phone and snapping a good pic regardless of the conditions - Apple proved that simplicity and seemingly effortless great results delivered with consistency are the way to achieve mass appeal, and if Nokia manages to pull it off in the phone imaging department, it will have a niche for itself that will be really hard for anyone else to replicate. damien dinning is a good mentor or leader for a good photography team. but I guess, he left his legacy by giving what the nokia photography team need to know. They are I think knowledgeable what damian wants to happen in the mobile photography. What about Nokia with Android OS? You need to start making handset for Android. Come on nokia is it that hard to see this. Yeah sole didn't do a darn thing. Their cameras were no better than most of those on feature phones until the 4S, and arguably the 4. That was 2010. By the sake time we had numerous better phone cameras from Nokia, Motorola, HTC, Sony, Samsung, etc. @Daniel: Edit out or modify that statement to take out the apple reference. It is unnecessary and misleading.